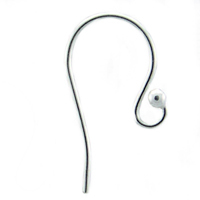 Sterling Silver Fancy French Hook (also called Fish Hook) Earwires. Unlike our others, this one has not been flattened, and has a gracefull curve with 2mm ball to add a touch of style. Measures approximately 19.25mm long (top to bottom), and 21GA thick.